Modern Warfare 3 has already been declared the Game of the Year by the only people who really matter - the bookies. Activision's Modern Warfare 3 came out today and while it might seem a bit premature to declare it "game over," that's exactly what Irish bookmaker Paddy Power is doing. The game has sold about a half a gajillion copies, give or take a bazillion or so, and that's enough for the bookie to stick a fork in its 2011 "Christmas Number One Videogame" betting. "At odds of 1/16 this contest is well and truly over," Paddy Power's Ken Robertson told CVG. "On its day of release we are happy to crown Call of Duty: MW3 this year's undisputed champion." 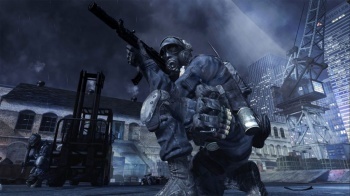 Sterne Agee analyst Arvind Bhatia predicted Modern Warfare 3 will move between 5.5 and six million copies in its first 24 hours of launch and post a ten percent unit sales increase over last year's Call of Duty: Black Ops, and ring up almost 18 million unit sales in the December quarter alone. Other games in the running include FIFA 12 at 6/1 [this is the U.K., remember], Gears of War 3 at 10/1, and the real long shots, Pro Evolution Soccer 2011 at 33/1 and Mario Kart 7 at 40/1. Not that any of them had a chance; the last time the Call of Duty series failed to take the top spot was in 2008, when World at War was edged out by FIFA 09.